We are rock stars in China! Everyone wants to meet us and see the bikes and get our autograph. Jeff and I had 500 postcards made each and we were down to about 250 left thinking we will have a lot left over. Not the case, in China whenever we stop there will be at least 4 or 5 often a lot more very interested observers. The cards help as we can point to the Canadian flag and say that is where we are from, followed by the reverse side with our route. 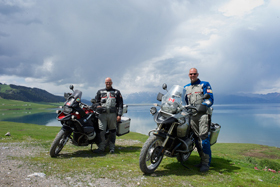 In China the word they use for BMW is Bao ma or "Treasure Horse" I was surprised with so few motorcycles how everyone would immediately call our bikes by this name. However it is taken from the car and from the logo applied to our bikes. However considering the donations made to BMW and Touratech I think Treasure Horse is a very accurate title. You cant help but smile when approach and the pleasant and genuine interest in our adventure. Certainly in China we feel popular. In the other countries people were very pleased to receive our cards as a souvenir but it is always interesting when we are often asked to autograph them in China. I would highly recommend that future Globeriders invest in making a greeting card for their journey it is a terrific ice breaker and removes the language barrier for greetings. Our first full riding day left Yining. Being in China I was anxious to practice or "play" Tai Chi outside the hotel hoping to find others doing the same. I did not find anyone else to practice with, but was quickly the subject of a few photographers documenting the odd sight of a westerner doing Tai Chi. As the others came out to pack our gear and prepare the bikes the crowd of picture takers grew to quite a few and we had quite a crowd as we left. Nice to be popular. In China there are rules for tourists. We have a national and regional guides, as well as each province will have rules on the roads we can travel. The first province we were only allowed on the main highway and in the next we were only allowed on secondary roads. The roads in China are not what I expected. In the real world I work with municipalities who use our software to manage infrastructure, so it is interesting to see how things are done in China. When we started on the road it was not the single lane rural road I expected. We first approached a toll gate and made our way to the right side around the barriers as motorcycles do not have to pay tolls on the highways. I like this place already. On the highway it was brand new 4 lane divided road that was brand new. The guard rails were pained light blue and shortly after we were on our way I saw a truck washing the guardrail to keep it perfect. For the past few years China has made a massive investment in their infrastructure especially the roads across the country. The good side is they build as fast as possible, the downside is when they do, they will rip up an entire road for 100km or more. Bypasses are limited if available at all. Certainly the least expensive way to build a road, but it is everyone for themselves in the construction zones. More on that later. 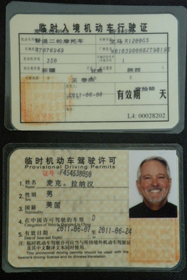 One nice event was when Mac rejoined our group in Urumqi with his new passport in hand. Mac had a time out while his papers were replaced after having them go missing in Lake Issyk-Kul. Nice to have him back, he is a real character and his enthusiasm is a spark for the group. In Turfan, after dinner and a traditional show 7 of us rented a donkey and wagon to tour the market with cameras in hand. We toured around stopping several times for pictures and ice cream before heading back to the hotel. It was a bit unnerving as cars would pass very close to the cart and several times the landing gear had to be retracted as the cars were too close for comfort. The riding days have been warm with temperatures often in the high 30's peaking in the early 40's Celsius. A few brave soles went out to the desert to find the lowest point in the heat of the afternoon and came back quite pleased at accomplishing their mission after enduring the very high heat. The hotels have been a nice oasis from the hot days ride always with a cold beer to celebrate completing our days adventure. Back to the land of Borat. Actually, I learned that the Sasha Cohen movie has little to do with Kazakhstan, but it has certainly raised the county's worldwide recognition. The beautiful capital, Almaty, has 29 universities with 125,000 students. Like so many other places we have seen, the city was destroyed by the Mongols in the 13th century, so everything is newer than that! Our hotel was a former guesthouse for top Communist Party brass, so it was quite nice. 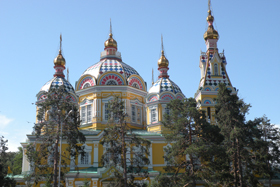 We saw many elaborate buildings made entirely of wood, such as the Russian Orthodox church below. It was Sunday, so we visited a Mass. Interestingly, the congregants only stand or kneel. There are no pews or seats of any kind. From the church we meandered down a walkway of blue spruce trees planted by visiting Presidents. It led to a monument to fallen soldiers. More than 600,000 Kaz soldiers died in WWII alone. We see a museum of traditional Kaz musical instruments and a national museum containing jewelry from 400 B.C. We see a fascinating live demonstration of hunting birds, including golden eagles and falcons. After a traditional meal in a yurt and an excellent performance of traditional Kaz folk music, we call it a day because China awaits! The border crossing takes two days. Never mind that we already have Visas and our paperwork was submitted two months ago! It took about nine hours to clear Customs on day 1. Certain improvisation was necessary. For example, even though all our gear was loaded into hard panniers (metal saddlebags), we were required to go through airport- like metal detectors. It was sufficient, however, for us to select only one bag each. The others remained on the bikes. Next we lined the bikes up in a giant x-ray machine used for trucks. We were sure to dismount and stand well clear for fear that our private parts might otherwise start to glow in the dark! Then it was lunch and naps under a nearby grove of trees while our local "fixers" haggled with the Customs officials in Chinese. Why does it seem as though they are always yelling at each other? After finally getting the bikes and our selves into the country, we head down the road to another city, where we will get Chinese driver's licenses and license plates tomorrow. Dinner was great, but the bed is the hardest I have ever experienced. I awake with a "crick in my neck," but press on we must. We first ride to a police station to have our bikes "inspected." This appears to consist of an exchange of postcards and mutual smiling photos. Then we ride to the equivalent of a Department of Motor Vehicles, where our VIN's are checked. We proudly receive our new Chinese licenses. (See below.). We hurry out of town before they think up new things for us to do. We are now "loose" in far western China. Most Americans enter China in Beijing or Shanghai. They expect and receive large crowds of people everywhere. Only Silk Road explorers see this part of China. It is fascinating. We arrive in Urumqi, the capital of China's most western province. We are still in Moslem country, and have yet to see a Buddhist temple. This is the most inland city in the world. China here is wide open spaces like the American west. It is more like Utah than metropolis. Our next stop is Turpan. 250,000 souls, 72% of which are Moslem. Our guide says the people are simple, honest and hospitable, and they appear to be so. We are in the Gobi desert, and it is really, really hot! Construction is everywhere. Major roads and bridges are going up. Entire communities of climbing cranes. Oil is clearly in the area. This country is on the move, and it is not only the big cities in the east of China that are booming. The Gobi is even drier and more barren than I imagined. In the midst of it all, however, spring oasis's. We saw how they work. Chinese ingenuity created an underground water system centuries ago. The snow melts in unseen, faraway mountains. As the water runs downhill in underground rivers from 25,000 feet to below sea level, the people have dug thousands of wells, spaced about 20 meters apart. There are about 5000 miles of irrigation system, feeding lush fruit and vegetable orchards. This irrigation system is one of three "wonders" in China, including the Great Wall. The esplanades are literally canopied with grapes. They make raisins, not wine. Mulberry trees feed silk worms, which make silk for trading. 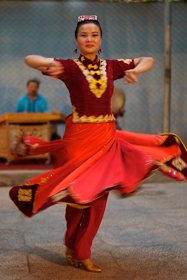 Silk traveled the Silk Road westward into central Asia, and coffee and fruit returned westward. It is easy to see how it all worked when you are standing in its midst! But on to more important things -- my massage! Chinese massage is painful. I present below a Chinese massage therapist. 70 pounds of feet, fists, knees and elbows. She balances on my spine like it is a gymnast's beam. Overhead support bars are for Thai sissies! I think she must have done a few flips. I will pit her against the best Turkish masseur any day. I survived her torture with no apparent injury! Is that what they call a happy ending? We have had mainly highways so far. Few cars, many trucks. 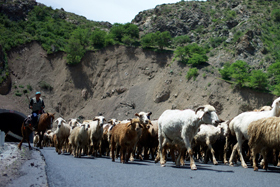 The Silk Road bustles with commerce, but on 18 wheels rather than four legs. There are literally thousands of trucks. They frequently try to pass each other and force us onto the shoulder. We encounter a construction zone that is 75 miles long! It is dirt, sand, silt, and the trucks are gridlocked for miles on end. We lane split between stopped 18 wheelers, and pass in clouds of dust where we can see only five feet. It reminds me of the pass on the Dakar rally. The Gobi mercilessly bakes us at 108 degrees. Fortunately, we again arrive safely, with persons and bikes in tact. On to beers, prayers of thanks and a long nap. Onward we go, deeper into the desert! 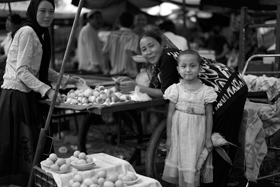 There is never a dull moment on the Silk Road in China! Today we ventured an easy 300 km (59 mpg imperial gas consumption) over the Kazak steppe. I could not help but wonder about the nomadic tribes of yesteryear and how they survived out here in often impossible circumstances in a mostly unseasonal climate. They were hunters not farmers and followed the migrating herds. What they did for greens and fruits I do not know. It is even more remarkable to consider how Gengis Khan succeeded in burying their tribal differences, united them all and conquered the whole world as it was known at that time. Arriving in a little one horse town called Zharkent we are now a stones throw away from the Chinese border which we traverse tomorrow. I arrived first and headed out to the market to find a map of this large country- see the attached photo of all the girls helping me in a little all-purpose store! It was fun because they were all interested in Canada and I got to pin a little 'Canada' pin on their shirts collars which I often do. I travelled most of the way today on my own and have discovered that it is a good way to go. Stop and go when you like; more of a sense of independence- I just like the freedom. A short riding day but stressful due to an 8 hour border crossing and 17 passport checks. 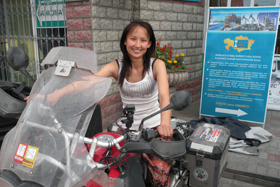 The Kazak process was easy but the Chinese steps were quite wearing- hurry up and wait- they aren't used to big, foreign motorcycles showing up on their doorstep and having Mac's bike along without the owner did not help proceedings. Helge did a great job of keeping everybody loose and shepherding the extra bike and all our gear through the process. We gained 2 hours on the clock and pushed away from customs around 7pm. The first thing staring you right in the face is orderliness. Chinese orderliness was awesome to see- lovely painted roads (no ruts or potholes! ), guard rails, organized farmland, the works. We pulled up to our hotel with a feeling of sheer exhilaration! Last border crossing (8 in all) and we are on the home stretch. Our dinner at our first round table was scrumptious- I have been a virtual vegetarian these last weeks but sure dug in to the meat dishes here. Lots of beers and hit the sack late. Nicolas said he felt like a rock star this morning as we were preparing to leave our hotel in Yining. There were at least 30 gawkers most with big cameras clicking away as our entourage left to go to the police station to acquire our temporary Chinese license plates. Stop, start, move, repeat- it took 4 hours to go 22 km from an inspection at the police station to a place where we were issued driving licenses and eventually we will get bike license plates as well. Chinese formalities! They were all very nice but it was another make work project for sure. Eventually off we headed off for our 432 km day. What a road! In the middle of nowhere there is the finest divided highway I have EVER seen! This is not a 100 mph road it is a 200 mph road for the right vehicle and almost no traffic. The whole thing was amazing from the animal fencing to the last detail of guard rails and paint on the road. It is another of these famous infrastructure projects that keep people busy and open up the hinterland. I feel sure that they will one day build an extension right through to Europe. I wish I had a picture of the gargantuan suspension bridge under construction that snakes along between two mountainsides, never seen anything like it and due to open next year. We went from the 6000 foot level and 16 deg C to the 600 ft asl at 37 deg in about 20 minutes- ie. we are approaching the famous Gobi Desert for the rest of the trip. Arriving in Kuytun with no waypoint to the hotel 3 of us got a taxi to our evening digs, we had another meal actually slightly better than last night (finally some flavour) and an early turn in for tired bikers. I have been very thankful for stocking up on granola bars at the outset- they are a welcome snack when breakfast is the same old same old chinese fare, sort of left over dinner from somewhere last night! Bike security has never been an issue. We cover them with special lightweight Aerostitch tarps each night in a well lit sometimes supervised area and it works out just fine. We have all got smarter and tie down the tarps under the bike so they don't blow away in a wind although one flew the cookoos nest the other night. I ventured off this afternoon on my own with one of our guides (Jyn) to the local museum. It showcases life, history and the silk road at its best in the province of Xinijang and is really outstanding. Two years ago the Chinese government in an effort to get more locals to learn about their history opened up all the museums in their country for free. Consequently the place was busy and I enjoyed watching all the comings and goings. The key thing to see at the museum is all the mummified remains of the indigenous peoples and how well they were preserved in the dry desert climate. The 'Loulan Beauty' was on a world tour but a replica was there along with a scene of how life was in 1800 B.C. She was of European descent for goodness sakes and looked it too- long brunette hair, round eyes etc., attractive and not oriental in the least. Another interesting tidbit is their poplar tree. It lives and thousand years, stands dead for another thousand and takes a third thousand to rot, now take that to the bank! The province of Xinjiang (one of 32) is huge and occupies a sixth of all of China and has a population of only 20 million- Urumqi is the capital with 3 million- 64% Uygur, 24% Han Chinese and a great mixture of the rest all getting along quite well according to Jyn . The province is quite well to do with lots of fertile farmland, animal husbandry and it has an abundance of oil and gas. It is buttressed by 3 mountain ranges and 2 large basins so they have lots of water. Tomorrow we head to the second lowest place on earth- near Turpan where we are staying it is 154 metres below sea level so it will be hot, hot, hot! We also get to have Mac back and I am sure he will be very glad to see us and us him. Hazardous traffic in and out of Urmqi and hot like hell. Just a zoo. We hung on each others tires in close formation to not let anyone break the link or miss a traffic light because our gps way point was only approx. We crawled along in first gear for what seemed ages with hot engines. 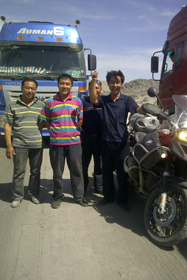 This morning we raced down the freeway to Turpan arriving about noonish. They have a 50 metre inside pool in the back of the hotel so a workout and a few swims and were in order. All was quiet until a few of the boys showed up. Nicolas from France hadn't had a swim for 5 years and proceeded to jump in with his specs on. Out he comes sans specs. Doesn't know it! Observant Len happens to notice the whole thing. All quite funny but how to retrieve the glasses 12' down in this near Olympic sized pool? A few dives and Voila! Mac is back! Randy and I spied him on arrival and went over to say hi. Mac, great to have you back, you just missed the best week of the trip. Why is that, Nick? You weren't here! Had to get that one in. Seriously though he was fortunate to have everything fall into place so nicely even though he had all that down time in Bishkek. A lost Canadian passport would have been a trip breaker for sure. He is in good spirits and rarin' to go. Time for a few comparative stats on China. I won't bore you with population or country size cause we all know that. The average age is high reflecting the concerns we are reading about their aging population- 34 and the highest by far of all the other country's we have visited (most mid 20's) except Georgia at 38. Their gdp is $4.3 trillion about 3X Canada's and about $6000 per head. Being only a few days here it is hard to make salient observations. I am impressed by the relative wealth of this geographically large province and the obvious lack of huge smokestack blast furnaces and chimneys belching black smoke. We shall see going forward. Today was a fascinating touring day of the sights surrounding the town of Turpan, population 250,000 (72% Urgyr, 20% Han Chinese). The Urgyrs pronounced weegar are noted for being simple, honest and hospitable- most are Muslims. Our first stop was Jiaohe City which was started in the first century BC and grew to about 3000 people in an area of about 100 acres. It was built or more correctly dug out of the hard clay surroundings at the confluence of 2 rivers. The remnants are quite well preserved and we struggled through the mid morning heat to listen to our guide discuss what life was like here in the time of the Han Dynasty (Buddhists) which lasted from the 2nd century BC to about the 8th century AD. This area is very dry and hot and in summer gets up to 47 degrees. 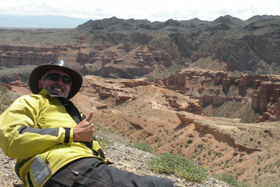 It is on the edge of the Gobi Desert which we start to traverse tomorrow. The remarkable thing about the Turfan area is the access to subterranean water from the surrounding Tien Shan mountain ranges. Two thousand years ago dwellers digging wells discovered vast amounts of water running underground and were able to link up connecting canals between the wells and direct the water into the very rich and fertile lower ground area around Turfan which is well known for growing all sorts of melons, grapes, raisins and other fruits. We visited a historical working museum depicting just how these below ground canals (called Karaz) have fed and continue to feed this area and continue its richness. There were at one time 5000 km of underground canal systems (300 km of above ground canals), 170,000 wells and over 400 holding ponds- incredible! It is easy to understand how this oasis area was so critical to the ancient silk road travellers. After coming in off the long, hot Gobi they had plentiful supplies of water, fruits and vegetables to replenish themselves and carry on. The Turfan irrigation system built up over many centuries of hard working human industry is really quite breath taking when you stop to consider the density of the hard clay that had to be excavated to make these underground channels-all 5000 km dug by man. It is third in Chinese stature behind only the Great Wall and the Grand Canal (6th cent AD from Hangchau 200 km south of Shanghai to Beijing, 2000 km as a shipping highway for freight). I would like to take a minute to contrast this water abundance to the deplorable conditions in modern day Beijing. The United Nations has a chronic water shortage guide that starts at anything below 1000 cubic metres per person. In a city of 22 million their number is a shocking 100 cu. m. per person!! Government officials have a huge plan to spend $62 billion (three gorges project half that, Olympics rumoured to be 40 billion) diverting water from the south through 3 immense canal projects to the thirsty north. Trouble is, the south of China is also verging on water shortages and the Gobi Desert is inexorably encroaching from the north and the east. To say the least, this is a HUGE political, enviromental and engineering problem especially when one considers the massive relocation of all the people involved. The Chinese are noted for their large scale can-do projects so we will see how they do here. Our last stop was a longish drive to some mummified tombs at Astana near a town called Gaochang. These 70 tombs over about a 50 acre area housed important people usually couples from 300 to 800 AD about 20 feet below the surface. Numerous tombs are well preserved due to the extremely dry conditions of the area. We raced down another hot (35 deg) boring highway 400 klics to Hami and not much to report except the extreme language barrier. The signage is double dutch everywhere. This morning there was finally milk for my cereal but both jugs were boiling hot and the coffee was lukewarm. Go figure! I may as well have gone out to the kitchen to milk the cow myself as try to explain the situation. Friday at the pool I go through my very best charade skills to tell the lifeguard I need a towel. Nothing doing! I traipse back up 15 floors on a slow elevator come back down with a towel and he laughs, reaches down into a cupboard and gives me a towel. Either he is a bit dim or my acting skills need polishing! -clean clothing- I have 3 pairs of socks and underwear each, 2 shorts and an assortment of shirts that are all light weight, easy to wash and quick to dry- usually in the sink or shower on a daily basis. -hotel rooms- nearly all the hotels we have stayed in and some are very nice drastically need new carpeting especially in the rooms; the Chinese compensate for this by supplying shrink wrapped flip flops for their customers! -check out procedures, wow talk about thorough and systematic! We are all getting used to it and it is the same everywhere. Every room gets an inventory count so there is no way any towels could dissappear for bike cleaning! The name Genghis Khan has come up a lot on this trip. Having completed the acclaimed book Genghis Khan and the Making of the Modern World by Jack Weatherford I would like to take a minute to cover off some of the myth, the legend and the reality of his mercurial dynasty. Yes he was a warrior, barbaric at times. Yes he conquered more territory than any other man in history (the population of his country was about a million in those days and his army of horsemen numbered no more than 100,000 men- 5 horses per man too). Yes there were family rivalries for a long period after his death. In spite of the carnage and the killing an amazing amount was accomplished in a few hundred years. In the first instance he always sent emissaries ahead to ask for their surrender and obedience. When this occurred they were welcomed into his system; when not, look out! Born in 1162 most of his exploits occurred in the early 1200's when he was a relatively speaking, old man. He died in 1227. He instituted the rule of law, abolished torture, decreed religious freedom for all and most importantly had no compunction about passing along the best of skills from one civilization to the next wherever it could be best utilized. Knowledge and ideas were welcomed and transferred over thousands of miles. Commerce and trade was encouraged and flourished in an almost global free trading system unknown in those days. Fiefdoms and aristocratic privileges disappeared and advancement came from effort and ability not nobility. One example I like is the modern day cannon came from the Mongols. They combined the Chinese invention of gun powder with Muslim flamethrowing techniques and European casting technology to produce the cannon. One of GK's grandsons Khubilia introduced paper currency and the concept of early education for young people to encourage literacy. Also, in 1272 he ordered the building of a new capital complete with a Forbidden City in what is now modern day Beijing- the forbidden part being the creation of a miniature Mongol steppe in the middle of the new city. What eventually got the Mongols was the Bubonic Plague or Black Death. Transported by fleas, it was a grotesque, torturous death. Untold millions died perhaps as many as a third of the Asian/European population of say 300 million at that time. All commerce and trade came to a screeching halt by the end of the 14th century and the thinly managed Mongol system control went with it. Mongol influence and the future results historically and otherwise of that influence was much bigger and more important than most people know or understand and I recommend the book. Today was probably the toughest but best riding day of the trip- a real test. We were told last night to get psyched up for some rough riding. The first 200 klics was the normal easy 100 mph stuff. The second 90 klics was to be a construction zone and slow going. The last 120 was a secondary road to our destination Dunhuang in the province of Gansu where we are now. The first bit should have been a breeze but a heavy cross wind developed and with not much to reference it was hard to know just how brisk the wind was. It was coming across the highway from left to right, there was a ton of large truck traffic and I was getting bufffeted like hell such that it was not comfortable. When the Chinese say a road is under construction you better take note! Well into the Gobi we came into this elevated, rocky, hilly, barren area at mileage 186. I was in the lead for the first while having elected not to fuel up with the others and wanting to get a head start on the hard part with a lower fuel load. I came across 10 klics of wall to wall stopped (huge) tractor trailers to mile 196- must have been several thousand of them all waiting their turn to go through the bottleneck of construction area. It was a zoo! I edged out on the steep side edge of the road (all gravel) for awhile until I looked down and decided one mis-step would not be pretty and started to proceed more inside at crawl speed between the traffic. Finally I got up to the juggernaut area where truck traffic was actually starting to move. The trail was so dusty and sandy and downright slippery I was really on my toes- when I could actually see because it was whiteout conditions from the billowing dust a lot of the way. 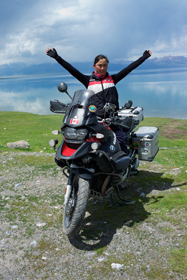 I managed to make friends with the trailer guys immediately behind at one of our many stoppages- got out the world map and some lapel pins and they gave me some water and jumped on the bike and pics were taken. If I dumped the bike which was looking quite probable someone friendly was needed not to run over me and to help right the machine. Finally got through about 5 klics of this in about an hour of sweaty hard work in temperatures approaching 40. The road opened up here and was a little quicker but it was still bumper to bumper. Often there were black shadows in front of the dusty gloom and I hoped like hell they were going with me and not towards me! I managed to get up a bit more speed and standing on the pegs for lower center of gravity and better visibility could get up to about 60 klics. Some of the faster guys had showed up by this time so I was able to ride along with them. We struggled along caked in dust and it was even grinding in my teeth! Finally after 3 hours of this we got to some gas stops but they wouldn't fill for some reason and fuel was getting real low. I hastened off wanting to be first to finish for some crazy reason but Dan was well ahead at this point so second seemed pretty okay too. I'm driving down this bumpy last 120 km, the gps says 77 to go and the fuel indicator says only 56 left! What to do? Would be pretty embarassing having to wait in 40 degree heat for somebody to come back. There in the distance low and behold is Dan with (another) flat tire! There helping him are 5 Chinese travellers on Honda 125's and one has a sidecar with some extra fuel. Horseshit (good) luck for sure! I get the fuel, Dan gets his flat fixed and we both end up dead last because all of the others have headed for the cold beers at the hotel! That's about all the excitment for this day and it was enough- only one dropped bike too, pretty good! A touring day in Dunhuang which is quite a clean, prosperous, modern city of 250,000 in the province of Gansu ; we drive out to visit the Mogao Grottoes which comprise approx. 472 caves carved in the side of an immense vertical hill outside of the city. Inside the large square and rectangular caves are the most amazing murals (nearly half a million sq. ft. of them) all with Buddhist scriptures, paintings and statues in almost perfect original condition. The caves are up to 1000 square feet in size and the biggest one has a Buddha 35 metres tall all carved meticulously out of the rock hill. They were built by Buddhist monks in the 6th and 7th century AD and are a priceless collection of what is called 'grotto art'. This evening we went on an interesting camel ride one mile into the desert sand dunes. Getting on and off is quite the lurching experience as these great beasts crouch down into the sand to let you on and off! 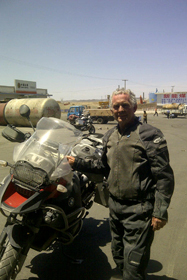 Tomorrow we are off again inching ever closer to Xian about 2000 km away! Turfan China.June 10.. I now know how all of the Oasis's get their water. As the water comes down from the snow capped mountains it goes to underground irrigation channels/streams that can be 100's of miles long. At certain points wells are dug and water can then be turned into irrigation ditches for water source and irrigation of crops. Thousands of years ago travelers could dig wells for survival. Even if all they had was sand and temperatures over 100 F.
In this area it was interesting to see miles and miles of Vineyards along the way. Typically grapes are dried in drying houses for a month or so and quite a variety of raisins are produced. Partially because Muslim is the overwhelming population wine is not made just raisins !! We also visited some Tang Dynasty tombs nearby Turfan from the 8th century. Royality was buried underground in the desert. Some of these were discovered by "tomb raiders" in the early 1900's and many artifacts have been moved to museums in London and St Petersburg, Russia. Others were looted over many years. Partially because of this China has a long time ago restricted foreignors from parts of China. Dunhuang, China June 14. We visited the Magao Grottoes. Almost 500 caves of Buddhist scriptures and paintings. This was an area of a hugh Buddhist monastary for living and praying. Incredible condition of paintings from over 1000 years ago. Also a statue of Budda over 100 feet high carved into the mountain.. Because of this incredible place it has turned into a large tourist attraction in this part of Western China. Buddhism a long time ago was replaced by the Islam religion in this part of the world. Soon on to the Great Wall of China and the Terracotta Warriors.